The Time-of-Flight Diffraction (TOFD) method can be regarded more and more as a standard NDT technique in an increasing number of countries. Nevertheless, there is still a considerable amount of development work going on. An overview will be given of the most relevant recent developments, including advances in TOFD transducer technology, modelling and interpretation tools, inspection of complex geometries and latest applications. In addition the current status of appropriate codes and standards will be reviewed. Although most TOFD inspections are performed on welds of simple geometry, such as longitudinal and circumferential welds, it is of great advantage if also the nozzles present in e.g. a pressure vessel can be inspected in the same go, and with the same technique. Therefore, systems for TOFD inspections must be capable of inspecting such geometries, which requires special software tools. Modelling software for the inspection of complex geometries will be discussed. General acceptance of the TOFD technique will only be possible if also the formal side of the matter is adequately organised. Initiatives in the Netherlands to establish acceptance criteria for weld imperfections detected with TOFD are now being materialised, and a qualification scheme for TOFD operators is being implemented. The status of these developments will be discussed. The Time-of-Flight Diffraction (TOFD) technique is rapidly gaining importance as a stand-alone inspection technique. 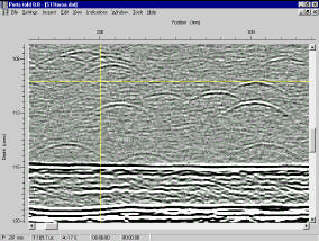 The TOFD technique is an advanced ultrasonic inspection technique that fulfils a need for reliable inspections. It is a powerful technique because it can simultaneously detect and size defects. TOFD is now routinely used in a wide range of applications such as inspection of piping and pressure vessels. through thickness extent, if exceeding a certain value (typical 2-mm), which means that porosity and slag will generally be detected as "indications without measurable height"
Information on the type of defect is limited, similar to both manual and mechanised ultrasonic inspection. This is not necessarily a problem, because from a fracture mechanics point of view, many defects that are normally regarded as volumetric, such as slag inclusions, may be sharp enough to be able to act as crack initiators. Also, this aspect is compensated, to a certain extent, by the ability of TOFD to distinguish between "defects without measurable height" and "defects with measurable height". The principle of the TOFD technique is based on mapping of the position of the edges of defects. This is in marked contrast with conventional ultrasonics, which relies on the amplitude of specular reflections received from defects. To determine the position of the defect edges, a wide-beam transmitter probe is placed on one side of the weld under inspection. An identical receiver probe is placed on the other side of the weld (figure 1). In the case of a flawless weld, the relevant ultrasonic signal will consist of a so called "lateral wave", corresponding to the direct surface path between transmitter and receiver, and a back wall echo. Between the lateral wave and the back wall echo there will be no signals. If defects are present in the weld, however, the ultrasonic waves will be diffracted by the edges of the defects. The depth of the defect edge can be calculated from the time of flight of the corresponding ultrasonic wave. Defect height can be readily measured by subtraction of the depth of lower and higher defect edge. Like any other technique, TOFD also has its limitations. In general the technique is less suitable for coarse grained materials such as many types of austenitic steel. Inspectability with TOFD is usually assessed on a case-by-case basis. In addition, inspection reliability close to the scanning surface is hampered by the presence of the lateral wave, which may obscure defects present in this area. Specialised software algorithms can be used to minimise this effect. Similarly, small defects located very close to the root of the weld may sometimes be obscured by irregular-ities in the root such as mismatch. General acceptance of the TOFD technique will only be possible if it is also properly embedded in codes and standards. With more and more experienced gathered the potential for the technique is rapidly increasing. Present developments in the codes, defect acceptance standards and personnel qualifications support this tendency. A procedure that describes how is data generated. This is the work procedure, which can be validated in combination with a reference block. The new generation of reference blocks contain an extra small hole just below the near surface. Detection of this hole (upper and lower signals) demonstrates that the object is inspected properly, which means that even the weak area of the technique is covered; if not, sometimes an extra scan of the surface zone may be required. A standard that includes acceptance criteria: these prescribe how recorded inspection data should be interpreted. A set of acceptance criteria is therefore needed. These have been developed in the said joint industry project. Personnel qualification. Initiatives in the Netherlands to establish a qualification scheme for TOFD-operators are currently being implemented. Inspection companies in the Netherlands have joined together in a committee to establish a procedure that rules the theoretical and practical TOFD training as well as the personnel examinations. Once established, these should result in general acceptance of the technique for an increasingly wide range of applications. Recently, new TOFD applications on 13%Cr steels, Titanium welds and even welds in some Duplex steels were successfully validated. Special software has been developed, to enable the use of TOFD on welds with complex geometry such as nozzles and offshore nodes  . The current generation of Portequip equipment was designed for flexible operation with various configurations ranging from a lightweight package for immediate mobilisation to a fully extended set-up for large and difficult inspections, including complex geometries under extreme weather conditions. The developments in the equipment were primarily driven by the need for portability, signal quality and operational flexibility. This means faster hardware, higher pulse repetition frequency (which means higher scanning speed) and compact less power consuming hardware. In addition new windows-based software makes the analysis and processing of recorded data a lot more flexible. 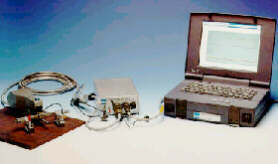 This in combination with improved filtering techniques and higher bandwidth, allow maximum advantage of high frequency probes. Mil-spec notebooks have replaced the large computers, see Figure 2. The development of TOFD equipment also included a new release of RTD PTOFD software. From the new Windows-based version 8.0, tools such as database, spreadsheet and word processors for field reporting are directly accessible. This set of tools also includes a ray-tracing module for the inspection of geometries such as nozzles and nodes. Software tools such as straightening, lateral wave removal and hyperbolic cursors that were previously available have remained. A new feature is that the inspection can be made available to the client on a CD-ROM, which can also include a special viewer version of the software. This enables the client to view inspection results on their own PC, and includes interpretation facilities and the possibility to export pictures for his own documentation and storage in a database. If required, the client's personnel can be trained in TOFD data interpretation. TOFD has always been the best NDT method to provide information for fracture mechanics and engineering critical analysis (ECA) calculations. It was traditionally used to back up more conventional inspection methods. Its increasing use as a primary inspection method has historically been limited by a lack of nationally or internationally recognised codes and standards that can be used with the method. This situation has progressively improved over the years, to the point where the inspection, interpretation and acceptance are well controlled. As the method was first devised in the UK, it seems appropriate that the UK should have been the first country to produce a standard for inspection using the method, British Standard, BS7709. This was essentially a 'how to' document, fitting for the first National standard in any method. Standardisation has progressed from this national code to an international effort involving RTD, as the work on TOFD spread beyond the British shores to Europe. The change was marked by the issue of a European prenorm prENV 583 Part 6, a co-operative international document. With these in place, the development of suitable acceptance criteria became vital. This has progressed by both the suitable adaptation of existing radiographic and ultrasonic codes and the introduction of specifically drafted acceptance criteria. Examples of the former include Stoomwezen Rules T-0117 and British Standard BS5500. Though both of these were originally drafted for use with conventional pulse-echo inspection (and include echo amplitude requirements), the specification of flaw heights and other dimensions has allowed them to be used for TOFD in their current form. Finally, there is the issue of the joint industry project mentioned earlier, that gives TOFD a consistent set of criteria agreed across a range of industries. The two basic requirements for suitable TOFD probes are high sensitivity and high bandwidth. The use of alternative crystal materials like Piezo Composites offers a significant improvement. Piezo Composites are especially appreciated in broadband applications. Another improvement is the development and design changes for high temperature probes. New wedge materials show less attenuation and new crystal designs show higher sensitivities. High frequency probes (up to 20MHz) can reduce the "dead zone" and increase the part of the volume of the material that can be inspected. The use of probes with frequencies higher than 15MHz strongly depends on smooth surface conditions, sound attenuation and ultrasonic material noise of the object to inspect. Reducing the dead zone increases inspectability of the zone just below the scanning surface. Although this indeed improves detection of test holes just below the surface of test blocks, according to recent code requirements, one should be careful in establishing validity under practical circumstances. The theoretical limitations in near surface flaw detection will always remain, because these are directly dependent on probe separation and probe centre frequency. In addition, the capabilities of the technique are influenced by geometrical factors such as surface condition and the presence of mismatch. Therefore extremely small dead-zones such as 1 mm can only theoretically be reached. Nevertheless it is without doubt that current software tools, high-resolution probes and miniaturised front-end electronics close to the probes help in achieving the best possible resolution close to theoretical limits. Over the years, many fingerprints of installations have been taken during their construction. The re-inspection after years of service shows that TOFD is highly reproducible, which makes the technique extremely suitable for monitoring of objects. TOFD has proven to be a valuable and economically attractive quality control tool for new objects. This can be indicated by the following two examples. 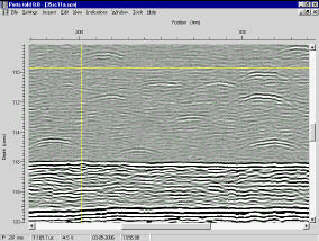 Figure 3 is taken as fingerprint of a heavy wall pressure vessel 5 years ago, during manufacture. Figure 4 is taken during maintenance inspection this year. It can also be observed that the more recent image is smoother and has higher resolution and signal to noise ratio, due to improvements in equipment and ultrasonic probes. A perhaps less well-known but powerful capability of TOFD is the inspection of complex geometries such as T-joints, nozzle attachment welds and offshore nodes, which may be very difficult or even impossible to inspect by other NDT techniques. When TOFD is used, the scanning operation even on such geometries is relatively simple, thanks to the presence of recently developed "smart" scanners, and provided probe configuration and probe positions have been carefully planned. A powerful software package has been developed by RTD to assist the TOFD operator and to optimise the reliability of the inspection. soon TOFD will have gained its place as a standard technique in the NDT toolbox, next to other techniques considered as conventional such as radiography and pulse-echo UT. H.H.J. Huynen, "Advances in Ultrasonic transducers", Röntgen Technische Dienst bv, WCNDT 2000.